BACKTIME: The Heritage Hodge-Podge: Who Will Emerge? It was a wild Saturday in Hilton Head to say the least. At one point there was a 9-way tie for the lead. Jim Furyk ultimately emerged as solo leader (-11) over Brit Brian Davis, with seven others tied just two shots back. But it doesn't stop there - there are actually 23 golfers within 5 shots. And you'd have to say just about all of them have a shot. I attended Thursday, my 3rd year in a row catching at least one day of the action and in following this closely, the better scores are generally recorded earlier in the day before the greens toughen up and the wind picks up. That's why Stewart Cink was able to win in 2004, entering Sunday 9 shots back. He's one of the group 5 shots back this year. Then again last year, Brian Gay's final round 64 took him to -20 and a 10-shot victory laugher. Who else to watch? Two-time champ Boo Weekley is 9-under. Personal favorite madman Stephen Ames lurks in the same group. As well as young guns Luke Donald and Ricky Barnes. Former champ Aaron Baddeley is at -8 with Camillo Villegas, and Zach Johnson is a legit threat at -7. My pick? Barnes. 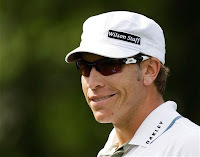 The man with the cool hat and the cocky grin has already scared the leaders in some majors. 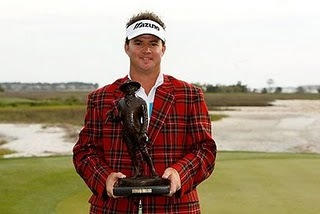 Now it's time to claim his first PGA win and the coveted tartan jacket. He's already a fashion outcast, might as well add some plaid!